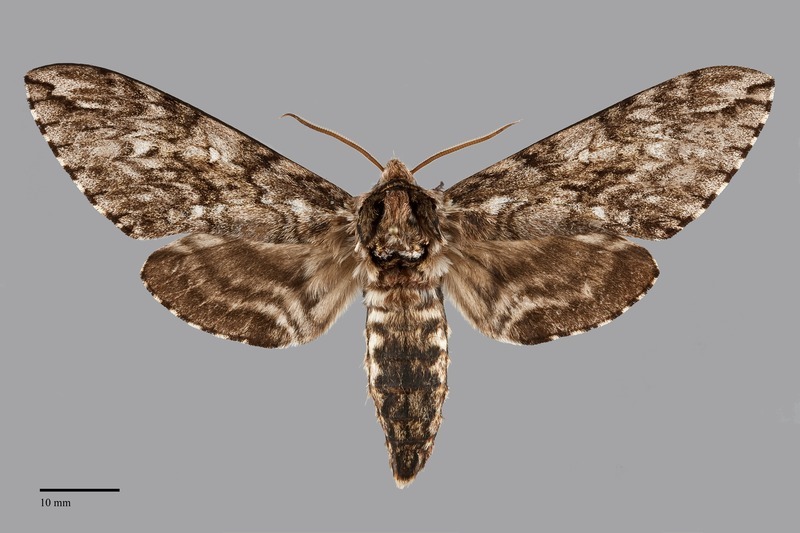 Ceratomia undulosa is a very large (FW length 43–47 mm; wingspan 7.6–11 cm) mottled gray-brown sphinx moth that has been introduced into our area from the East and is found only rarely in our region. The forewing color is variable, mottled gray brown, tan, or brown, slightly lighter and grayer in the terminal area than elsewhere. It is marked with distinct wavy and zig-zag dark transverse lines, strongly toothed at the outer part of the postmedial line and inner subterminal line. A series of dark lines on the veins at the outer margin and checkering of the fringe produce a series of black T-shaped marks that are characteristic for the species. A series of horizontal dark gray lines are present between the veins on the mid-wing. The discal spot is small, black filled with light gray. The hindwings are gray, tan, or brown background that is warmer and darker than the forewing color. It is marked by wavy blackish gray lines. The hindwing fringe is distinctly checkered white and dark gray similar to that of the forewing. The head and thorax are gray-brown, darkest brown on the tegulae which are outlined by black. The abdomen is gray, brown, and black with weak transverse stripes on each segment. The antenna is brown, club-like. This species can be recognized by its very large size, typical sphinx-moth shape and club-like antenna, and mottled brown-gray color with black T-shapes at the end of each forewing vein. It is most likely to be confused with Ceratomia amyntor, another eastern species. It has less crisp lines than C. undulosa and lacks the characteristic T-shaped marks. The larvae are variable with colors from light green to dark brown and may be mottled as well. The most distinct characters are the seven white backward slanting lateral stripes that run the length of the larvae and the distinct caudal horn. This species is common and widely distributed in moist hardwood forests throughout eastern North America, extending westward to the Rocky Mountains. It occupies riparian and urban areas at low elevations in the Rocky Mountain region. Although this species is mostly limited to the eastern part of North America, Smith (1995) gives a record from Jackson County in southwestern Oregon. A population has recently been found in Park County, Wyoming at the edge of the Pacific Northwest region. The global range of this species is limited to North America where its range extends from southern Florida to West Texas in the south and Newfoundland to southeast Alberta, Canada in the north. The range approaches the Pacific Northwest in northeastern Utah, Wyoming, and in the foothills of the Alberta Rocky Mountains. While it is very abundant in the eastern portion of its distribution, it is relegated to more isolated patches further west. 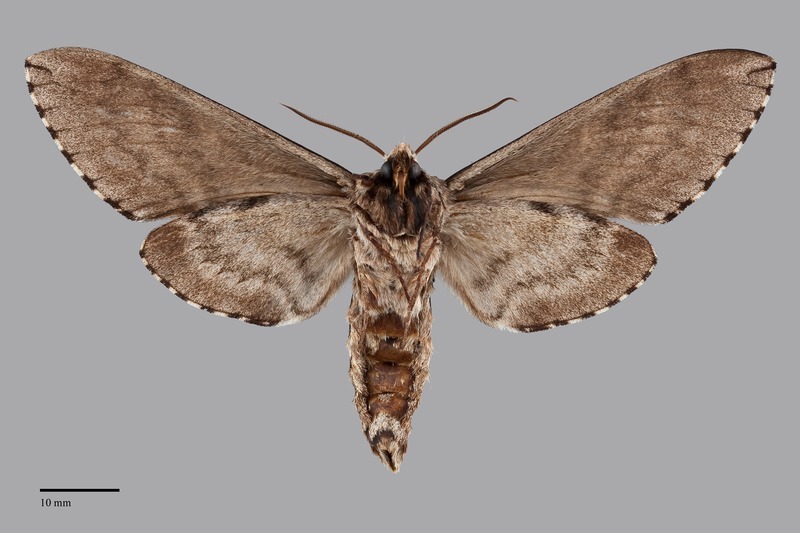 Ceratomia undulosa produces primarily a single generation per year with flight from late May to mid July, with potentially more generations produced in more southern locations where flight times may be much longer. Adults probably feed on nectar despite evidence of a reduced proboscis length and weak associated muscles. The adults are nocturnal and are caught easily at lights. The eggs are laid singly on the undersides of host plant leaves. Larvae are solitary feeders on mostly ash (Fraxinus spp.) in the Oleaceae, but may also be found on privet (Ligustrum spp. ), fringe tree (Chionanthus virginicus), oak (Quercus spp.) in the Fagaceae, and hawthorn (Crataegus spp.) in the Rosaceae. Pupation occurs underground in a chamber several inches deep.